The land is now cloaked in brilliant hues of orange and golden and red. The tilting of the Earth is inexorably bringing us into colder weather and shorter days. With a warm weather feeling like an Indian Summer last week-end, gathered round a communal feast, the crew here at Cabot Head took time to express what each one of us was giving thanks to: among others, a bountiful Earth, the joy and privilege of being at Cabot Head, living in a peaceful society. 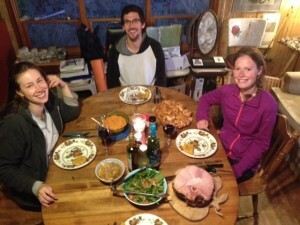 Then, we indulged in the tradition of eating too much food and dessert. 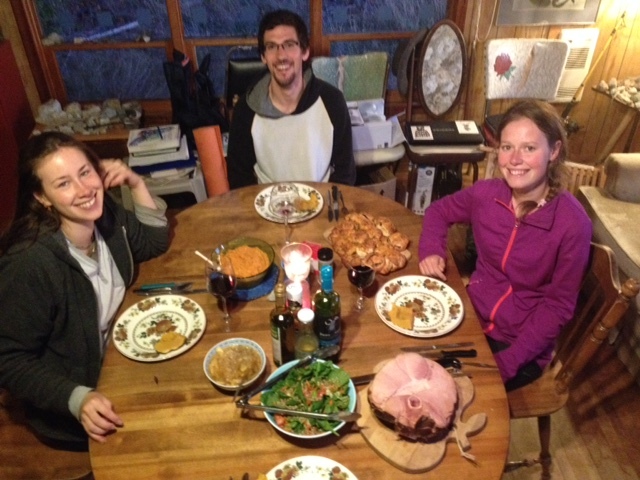 In case you’re wondering, there was no suffering at an isolated outpost that night: for the main course, we had oven-baked, maple-syrup-glazed ham on its bed of onion and apples, very buttery and garlic-y mashed sweet potatoes, acorn squash, the token green salad! No less than 3 desserts satisfied the sweet tooth: a surprise delivery of a homemade pecan pie (thanks, friend), and Cabot Head homemade pumpkin pie and brownies. Weather is in a changing mood these days, swinging from warm to cold, calm to stormy! We had very strong South wind for 2 consecutive days this week, completely precluding banding. With some rain in the mix, there was not very many birds banded this week. A Northern Parula got caught on October 14, the second this fall. It is almost never captured in fall at Cabot Head, with only 2 birds banded in the previous 13 falls (one in 2005 and one in 2008). It is a bird that tends to stay high in the trees, thus evading our nets. 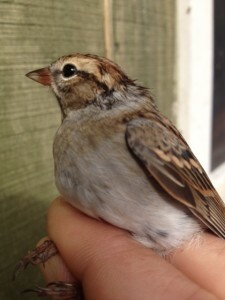 Even in spring, when it is detected more often, there’s been only 26 Northern Parulas banded over 14 years! It seems that this fall we’ve been graced with rarely captured species. 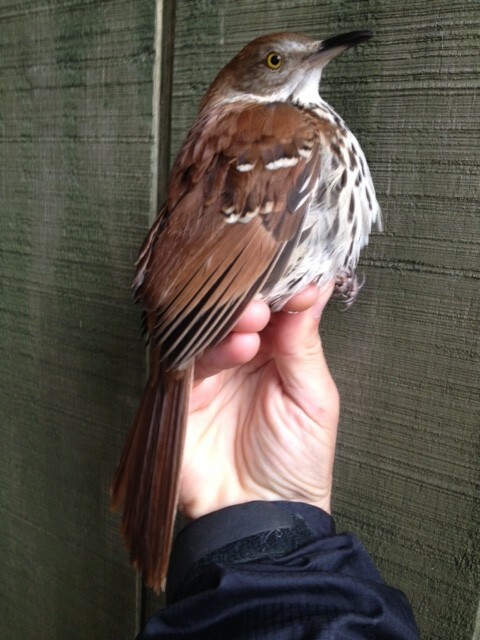 More and more American Tree Sparrows are arriving, joining the Juncos and White-crowned Sparrows. Kinglets are still on the move in good numbers. The last stragglers of Blue Jays are streaming by. Young woodpeckers are dispersing, mostly Downy and Hairy, resulting in some captures. On October 15, there was an intense, though short-lived, thunderstorm! It was weather warm enough for a dragonfly to still enjoy life. But we are now expecting some snow flurries for the weekend. The unsettling and unsettled weather of autumn brings excitement and surprise! Finally, this morning (October 16th), a very hungry little bird was feeding frantically on the station road. So intent in eating, it let us approach within a few steps, giving us ample time to observe every detail, so we could made a definitive identification: it was a young Lapland Longspur! 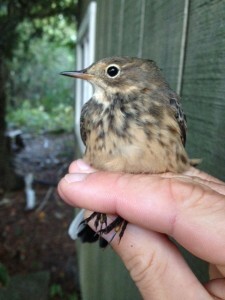 Like American Pipit, this species breeds in Ontario only in the thin sliver of tundra along Hudson’s Bay, at least 1,000km away from Cabot Head. ‹ Stephane’s blog for October 9th. This is like reading a food blog. I’m hungry! Thanks for sharing all your news! Your writing is wonderfully descriptive,Stephane. I really enjoyed my time at Cabot Head, and admire and appreciate the work that you and the crew do there. Greetings to all! Wonderful time of year, I agree totally, and very much to indeed be thankful for. You do an excellent job at Cabot Head Research Station, and the BPBO admires you for it. Enjoy what we have left of October. I am in awe of your writing and descriptions. Our seasonal changes are magnificent. I do detect some glasses of wine on the table, and so you should. Enjoy.